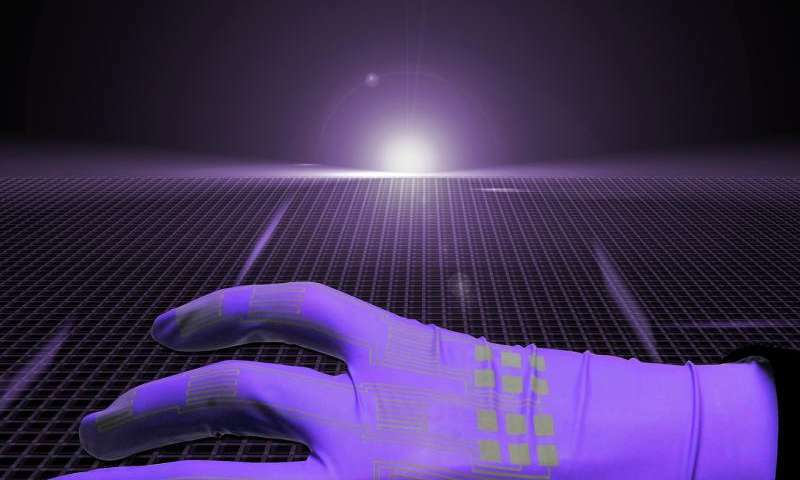 "We want to create stretchable electronics that might be compatible with soft machines, such as robots that need to squeeze through small spaces, or wearable technologies that aren't restrictive of motion," she said. "Conductors made from liquid metal can stretch and deform without breaking." "This process now allows us to print flexible and stretchable conductors onto anything, including elastic materials and fabrics," Kramer said. A research paper about the method will appear on April 18 in the journal Advanced Materials. The paper generally introduces the method, called mechanically sintered gallium-indium nanoparticles, and describes research leading up to the project. It was authored by postdoctoral researcher John William Boley, graduate student Edward L. White and Kramer. "Liquid metal in its native form is not inkjet-able," Kramer said. "So what we do is create liquid metal nanoparticles that are small enough to pass through an inkjet nozzle. Sonicating liquid metal in a carrier solvent, such as ethanol, both creates the nanoparticles and disperses them in the solvent. Then we can print the ink onto any substrate. The ethanol evaporates away so we are just left with liquid metal nanoparticles on a surface." "But it's a fragile skin, so when you apply pressure it breaks the skin and everything coalesces into one uniform film," Kramer said. "We can do this either by stamping or by dragging something across the surface, such as the sharp edge of a silicon tip." "We selectively activate what electronics we want to turn on by applying pressure to just those areas," said Kramer, who this year was awarded an Early Career Development award from the National Science Foundation, which supports research to determine how to best develop the liquid-metal ink. "For example, how do the nanoparticles orient themselves on hydrophobic versus hydrophilic surfaces? How can we formulate the ink and exploit its interaction with a surface to enable self-assembly of the particles?" she said.